I know I’ve been cooking lots of Chinese food for the past…let’s see…almost one month ? Thank you for bearing with me through this journey. It was the discovery of Fuschia Dunlop’s three cookbooks, Revolutionary Chinese cookbook, Shark’s Fin and Sichuan Pepper, and Land of Plenty that got me intrigued to try the recipes out. Honestly speaking, I didn’t know much about Chinese cooking. Well, we are traditional Chinese family, but there are lots of things I didn’t have opportunity to learn back in the old days when the Chinese language was still banned in Indonesia. I’m happy to learn that Chinese language is being taught now though. My mom did teach us to speak, read and write Chinese, however, as we grew older and with less practice, I had started to forget quite a bit of them. During my three-year journey living in Singapore though, had somehow helped because I was exposed to the conversation in Mandarin and watching lots of movies in Mandarin. So that helped. My mission now of course I want my daughter to learn another language besides English, which she is learning three actually: English, Mandarin and Hokkian, well, and a bit of Indonesian Malay. 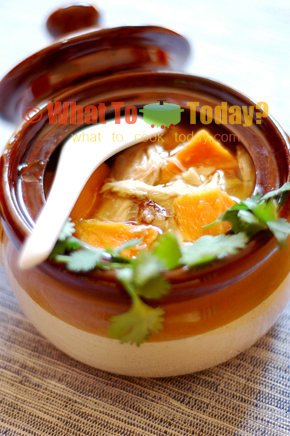 When I see this chicken and papaya soup in Fuschia Dunlop’s Shark’s Fin and Sichuan Pepper cookbook, I was definitely all curious how it would turn out. I had a soup made with green papaya before. My mom made fish with green papaya soup for me when I just had my baby. Green papaya tastes totally different from ripen papaya. 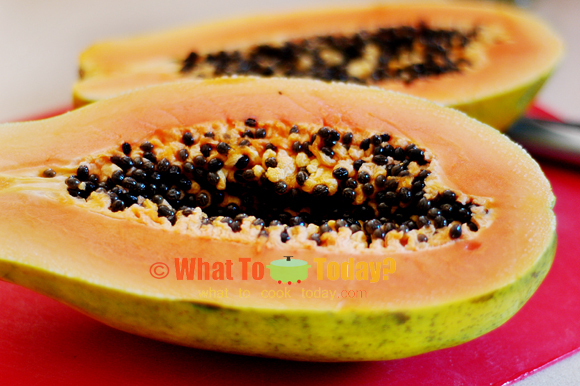 The ripen papaya is very sweet and tasty. Green papaya doesn’t have much taste, but if you use it to cook soup, it will pick up flavors from the soup. 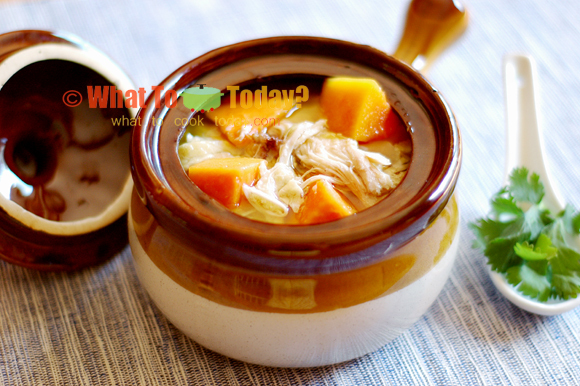 As weird as you may think about this papaya soup, I strongly encourage you to give it a try. 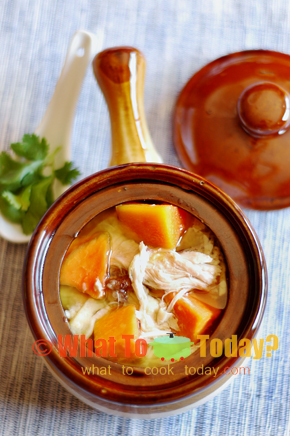 The papaya really sweetened up the soup (in a good way), even my daughter loves this soup when I made it the other day. Such a simple soup with wonderful taste. This recipe is adapted from Shark’s fin and Sichuan Pepper – A sweet-sour memoir of eating in China by Fuschia Dunlop. Published by W. W. Norton & Company.